If you have a roof rack on your vehicle, you should know how to use that and you should always put it to good use. The team here in Los Angeles wants you to know how to best use every part of your vehicle, including the roof rack. 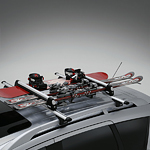 When you are using your roof rack, make sure that your properly secure those items that you are stashing on top of it. You do not want anything flying around when you put your car in motion. Always read the instructions that go along with any feature of your car before you put that feature to use. Read up on the roof rack before using it. We want your vehicle to always work out well for you. If you have service needs and you would like a professional team to handle the work that needs to be done, contact Kia of Downtown Los Angeles to set up an appointment.